PETALING JAYA: Asia’s property market is making a strong comeback with renewed buying interest for residential property powering sales on expectation that the economic downtrend is bottoming out. However, the commercial property market, including office and retail space, is still quite soft as easing demand has resulted in rental and occupancy rates sliding. Bouncing back from the dampened sentiment brought on by the global financial crisis, the regional property market has shown more resilience this time around compared with the 1997 Asian financial crisis which took a heavier toll on the market. There is increasing evidence that the US recession is bottoming out and this will stabilise the region’s economy and spur its recovery during the second half of the year. The recovery is expected to provide a favourable basis for both residential sales and leasing markets in Asia, including Kuala Lumpur, Singapore, Hong Kong and Jakarta. Industry observers are expecting a more robust revival in the region’s property market towards the end of the year, in tandem with a further pick-up in the global economy. Home prices are forecast to see further upside, driven by huge liquidity in the economy as well as further rebounds in residential rents. UOB Kay Hian in a recent regional market update said residential sales made a strong comeback in the second quarter of this year on expectations of an economic recovery and relative stability of the job market, despite a steep fall in gross domestic product growth rates, low mortgage rates and a lack of alternative high-yield investments. “Price levels rebounded by 5% to 10% quarter-on-quarter in the second quarter after a 30% to 50% fall from the end of 2007 peak levels. As the economic recovery gains ground in the coming quarters, we expect sales momentum to pick up and price levels to firm up further on the back of improving liquidity conditions and easy financing options,” the research house added. UOB Kay Hian said structural transformation had lent a high degree of sustainability to the current recovery. Across the region, interest rates are drastically low and currencies are fairly stable in comparison to the situation during the Asian financial crisis. “Household affordability levels are relatively high this time around due to the higher income levels, record low mortgage rates and stronger net household wealth. Corporate balance sheets are also a lot stronger. Furthermore, favourable migratory patterns to Asia due to its attractive long-term growth potential help support a sustainable recovery in the residential sector,” the research house explained in its report. 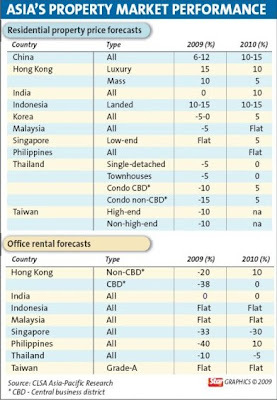 In the office property sector, stabilising economic conditions since June provided support to the prime office market and rentals in Asia for the rest of the year are unlikely to fall as drastically as in the first quarter 2009. Knight Frank said on the flip side, a continued downward adjustment in occupancy costs could raise the competitiveness of doing business in most Asian cities, and provide more business opportunities for international firms and investors. Although Kuala Lumpur still lags behind some regional cities like Singapore and Hong Kong, residential property sales have improved. ECM Libra senior analyst Bernard Ching said the local residential market was more resilient than other regional cities and prices had not been much impacted. This compared with a price drop of about 30% to 40% in Singapore and Hong Kong, he added. The affordable interest rate environment and lower entry cost for buyers supported property buying and investment activities during the period. With the average mortgage base lending rate (at 5.5%) minus 2% at an all-time low, Ching said property investment was making a comeback as the preferred hedging tool against inflation. According to Reapfield Properties Sdn Bhd president David Ong, clearer economic direction in both the global and local arenas had pushed property to regain its position as one of the leading investment instruments among Malaysians. “Coupled with the more liberalising environment, the property market is in for stronger growth and sales performance going forward,” he noted. Recent policy liberalisation measures to attract foreign direct investments to Malaysia’s real estate market and relaxation of rules on property purchases by foreigners have also resulted in positive effects on the property sector. In Singapore, improved market sentiment and pent-up demand stirred private residential launch and sales activities in the first half of this year with a total 5,992 units launched. Knight Frank said 7,374 residential units were sold during the period, exceeding the total sold in the whole of 2008 by 68%. “With the take-up significantly exceeding the units launched, it suggested some projects which were launched before this year received strong buying interest and this allowed developers to move outstanding stock,” it noted. UOB Kay Hian said the two upcoming integrated resorts (IR) in Singapore, which were slated to be ready by the year-end, would boost the city state’s long-term economic fundamentals. The IR projects are expected to create 50,000 to 60,000 jobs and would directly contribute S$5.4bil to the Singapore economy, or 2.6% of GDP, by 2015. The liquidity and openness of Singapore’s property market have contributed to attracting high net worth individuals and talented people to its shores. This is a boon for the property market as it makes a sharp rebound from the meltdown of the past year. Indicators are pointing to increasing possibilities of a sustained sales activity and price recovery. These include stabilisation in the economy, which may be able to prolong homebuying sentiments for the second half of 2009. Various findings by recruitment firms also showed that firms are more likely to hire than before. Together with the current low interest interest rate environment, these may boost the confidence of buyers for mass-market homes who are concerned with affordability and financing issues. “As such, homebuying sentiments may persist in the second half, although the number of new homes sold is likely to slightly decrease as the pent-up demand weaken and prices are also increasingly resisting downward corrections,” the research house added. Meanwhile, Knight Frank said China’s property market was back on its feet following the government’s supportive measures as well as price discounts offered by developers that helped release the pent-up demand for residential properties in key cities. Amid a lack of new residential supply in core districts, buyers are shifting to the secondary market, which saw strong rebounds in both transaction volumes and sales prices in the first half of 2009. A more active office market is also expected in most Chinese cities in the coming 12 months with developers launching projects and acquiring land for future office developments amid a recovering market. Its views are echoed by US research company Real Capital Analytics Inc that reported China’s commercial property transactions totalled US$31.2bil in the first six months this year following a surge in land sales after the government eased credit terms. Capital inflow from mainland China into Hong Kong has contributed to a rebound in luxury home prices in the Special Administrative Region (SAR). Compared with the market trough last December, Hong Kong’s housing prices have rebounded 27.2%. According to CLSA Asia Pacific, capital continued to flow into Hong Kong, bringing the aggregate balance in the banking system to HK$211bil, as at Aug 21. A number of local property veterans jumped on the bandwagon, engaging in batch acquisitions in The HarbourSide in Kowloon Station. One acquired 12 units for about HK$100mil and another bought six units for HK$90mil. In Indonesia, the disbursement of 2.5 trillion rupees in housing subsidies allocated in the 2009 budget and the finalisation of the government’s ruling on foreign ownership are expected to boost overall demand for property. Thailand’s property prices have also recovered to its previous level due to the high liquidity in the system, low interest rates and property tax incentives. Although high-end condominiums that cater to foreign buyers succumbed to about 30% price correction, they have since found support from wealthy domestic bargain hunters. Sunway Damansara Sdn Bhd, a joint venture between Sunway City Bhd and Perbadanan Kemajuan Negeri Selangor (PKNS), will open a new lifestyle retail centre in Kota Damansara, Selangor, in December. Dubbed "Sunway Giza", the RM141 million centre will consist of 48 units of shop offices, a three-storey lifestyle shopping mall and an 800-bay basement car park. It will also feature a pedestrian-friendly covered boulevard, which links the shop offices and shopping mall. In a statement issued last week, Sunway Group chief executive officer of shopping malls, H.C. Chan, said Sunway Giza has already seen a take-up rate of 85 per cent. He said Sunway Giza will be managed by the same team responsible for the management of the Sunway Pyramid shopping mall in Petaling Jaya, Selangor, the Sunway Carnival in Seberang Jaya, Penang, and the soon-to-be-launched Sunway Velocity in Kuala Lumpur. On Thursday, a signing ceremony was held between Sunway Damansara managing director Ngian Siew Siong and Village Gourmet Sdn Bhd managing director Ong Kim Too for the latter to operate a supermarket in Sunway Giza. A South Korean property firm may invest RM1.5 billion to build hotels and a theme park in Selangor Science Park 2 (SSP2), an integrated development in Cyberjaya. A source said the developer had expressed interest to buy land from the Selangor State Development Corp (PKNS). "The investors met PKNS officials two weeks ago for a discussion. They have seen the layout and concept of SSP2 and like it," the source told Business Times. The source said the developer also wants to build resort-style homes and plans to market the properties in Asia-Pacific, Europe and the US. If the deal materialises, it will be the fourth for PKNS this year. On August 21, PKNS signed agreements with property developer Metro Kajang Holdings Bhd, investment group Andaman Group and Q-Cells, a Germany-based solar cell manufacturer, to develop land at SSP2. They plan to collectively invest RM6 billion in SSP2. PKNS general manager Othman Omar had said that more investments were expected to come from Singapore, South Korea and Indonesia, and that there were enquiries about SSP2 from the rest of Asia-Pacific. The 400ha project was launched in 2007, with more than RM600 million spent on infrastructure. The development plan shows that there will be 108 semi-detached factories and industrial lots as well as 261 shop lots, shop-offices and commercial lots. It will also feature 9,289 units of workers' quarters, low- and medium-cost apartments, serviced apartments, condominiums, double-storey link houses, semi-detached homes and bungalows, covering 12 per cent of the total development area. The remaining 38 per cent is for recreation and sports facilities, parks and green area. 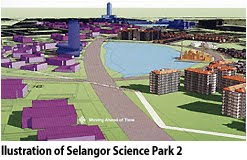 SSP2 is projected to create 20,000 jobs and spur Selangor's economy. The five-star Nikko Bali Resort & Spa said it will maintain its 2009 budget of US$9 million (RM31.77 million) to upgrade and promote the property, despite poor global market sentiments. General manager Jean-Charles Le Coz said Nikko Bali has so far spent US$7.5 million (RM26.48 million) to refurbish all the 386 rooms and two food outlets. The refurbishment was completed in June and it was the first exercise by the 13-year old resort. Le Coz told Business Times that it will be spending another US$1.5 million (RM5.30 million) to promote Nikko Bali in Asia Pacific and Europe. “Whether there is a downturn or not, the property (Nikko Bali) has to look good and be marketed well. We did this last year and it has yielded positive results. We are expecting to achieve a revenue of US$17 million (RM60.01 million) this year,” he said. Le Coz said he believes Nikko Bali can achieve a higher revenue next year as it aggressively promotes the meeting, incentive convention and exhibition (MICE) business. “We are a five-star property in a holiday destination and therefore have to offer the best services. If we need to spend money for the betterment of the property, we will do it. We will not compromise on service either,” he added. Le Coz is no newcomer to Bali, having held consultant and managerial positions in various resorts and opening innovative properties such as Novotel Benoa Bali and Haris Resort Kuta. He earned his degree in Hospitality Management at the Ecole Hôtelière de Lausanne in Switzerland. His background spans 14 years in the international hospitality arena including Geneva, Paris, Phuket, Jakarta and Lausanne.